Innate helper cells: a novel cell type essential in the initiation of asthma? The role of the innate immune system in asthma initiation is being increasingly recognised, and several innate epithelial cytokines, such as interleukin 33 (IL-33), IL-25 and thymic stromal lymphopoietin, have been described as important in asthma pathogenesis. However, until now, the mechanism by which these cytokines initiate Th2 responses and form a link with the adaptive immune system was undetermined. The recent discovery of a new group of non-T, non-B innate helper cells, which are induced by epithelial innate cytokines and secrete the Th2 cytokines IL-4 and IL-13, may provide a mechanism by which the innate and adaptive immune systems become activated in asthma. Although adaptive immunity and T helper 2 (Th2) lymphocytes have important roles in the pathogenesis of allergic asthma, it is becoming clear that innate immune mechanisms, involving a host of newly identified cytokines and cell types, can also contribute to airway hyper-responsiveness, eosinophilic inflammation and mast cell infiltration in a T and B cell independent manner.1 Over the past 20 years, key roles in the initiation and maintenance of type-2 immune responses have been assigned to mast cells, dendritic cells, basophils, eosinophils, alternatively activated macrophages, natural killer T cells, epithelial cells and γδ T cells. Many of these cell types are sources of the cardinal type-2 cytokines interleukin 4 (IL-4), IL-5 and IL-13, which are induced following allergen exposure in asthma. The most recent development in this area has been the discovery of several novel innate immune cell types (innate helper cells) that mediate anti-helminth immunity through the direct production of type-2 cytokines in models of gut parasite infection.2–5 Innate helper cells are induced in response to cytokines IL-33, IL-25 and thymic stromal lymphopoietin (TSLP), which are released by non-immune structural cells, such as the epithelium, endothelium and smooth muscle. The active role of structural or barrier cells in initiating immune responses to environmental insults has been increasingly recognised. Importantly, the release of the innate cytokines (IL-33, IL-25 and TSLP) in response to such stimuli has been detected in asthma. IL-33 is expressed in asthmatic bronchial epithelium and smooth muscle, is increased in severe disease and has been associated with asthma in a genome-wide association study. TSLP is expressed mainly by epithelial cells at barrier surfaces (skin, gut and lung); its expression is detected in the airways of patients with asthma and TSLP mRNA expression correlates with disease severity. IL-25 (also known as IL-17E), a member of the IL-17 cytokine family, is expressed in mouse and human lung epithelial cell lines after exposure to allergens, particles and helminth parasites. IL-25 is also produced by activated eosinophils, bone marrow-derived mast cells and basophils after FcεRI cross-linking in the lung. The release of these epithelial cytokines in response to environmental stimuli has led to the investigation of downstream pathways and responses. Recently, four research teams have described novel immune cells (innate helper cells) that are induced by these innate cytokines and release the Th2 cytokines IL-4 and IL-13 independently of an adaptive immune response.2–5 Importantly, all four teams have used a gut parasite model, but the application to allergic asthma seems critical. It is proposed that epithelial production of the innate cytokines IL-33, IL-25 and TSLP in response to worm infection results in the induction of these innate helper cells (termed natural helper cells, nuocytes, innate helper 2 cells or MPPtype 2 cells), which in turn produce IL-4 and IL-13 to induce the Th2 type allergic response. Although their precise characteristics are still being delineated, these innate helper cells do not express lineage markers (for T and B cells) but do express c-Kit, Sca-1, IL-7R, IL-33R and IL-17RB. After being stimulated with IL-25 or IL-33, these innate helper cells are a major source of Th2 cytokines in innate immunity. Furthermore, these cells have the potential to function as antigen-presenting cells because they have high expression of MHC class II and co-stimulatory molecules. Although innate helper cells have been described only in animal models of gut parasite infection to date, their role is intriguing, and a search for these cells in allergic airways disease in humans both in vivo and in vitro is urgently needed. The importance and active participation of airway structural cells in the immune response to allergens and infection in asthma are becoming increasingly apparent. Recent publications have emphasised the critical part played by the bronchial epithelium in the initiation of an innate immune response following exposure to foreign particles. Until now, therapeutic targets have focused on Th2 cytokines (IL-4, IL-5 and IL-13) or on the elimination of eosinophils and mast cells. However, the reason that these approaches have had limited efficacy in the clinic becomes clear when the equal roles of the innate and adaptive immune systems in propagating an allergic response are considered. Targeting molecules that are downstream of the innate immune cytokines may be unlikely to prevent disease progression. Equally, the role of each innate cytokine is unlikely to be uniform across all patients with asthma and at all ages. The production of innate cytokines and induction of innate helper cells to initiate a Th2 response may be especially important in the development of asthma in children. It is likely that this pathway may predominate in the presence of a maturing immune system with incomplete adaptive responses. Combined with the discovery of several previously unknown molecular pathways involving IL-25, IL-33 and TSLP, it is clear that the traditional Th2 paradigm of asthma must be extended to include many additional non-traditional pathophysiological pathways. Although these pathways can develop independently of each other, they can also coexist and interact (figure 1). New and effective therapies for asthma must be individualised and personalised, taking into account the distinct pathogenic mechanisms that occur in each patient. Just as we are now accepting the equal roles of airway inflammation and remodelling in the pathogenesis of asthma, we need to recognise that the immune response in asthma is initiated equally by the innate and adaptive immune systems, and that the innate arm is probably instigated by active cytokine secretion from structural airway cells. Th2 cytokine production by innate helper cells: application to allergic asthma. 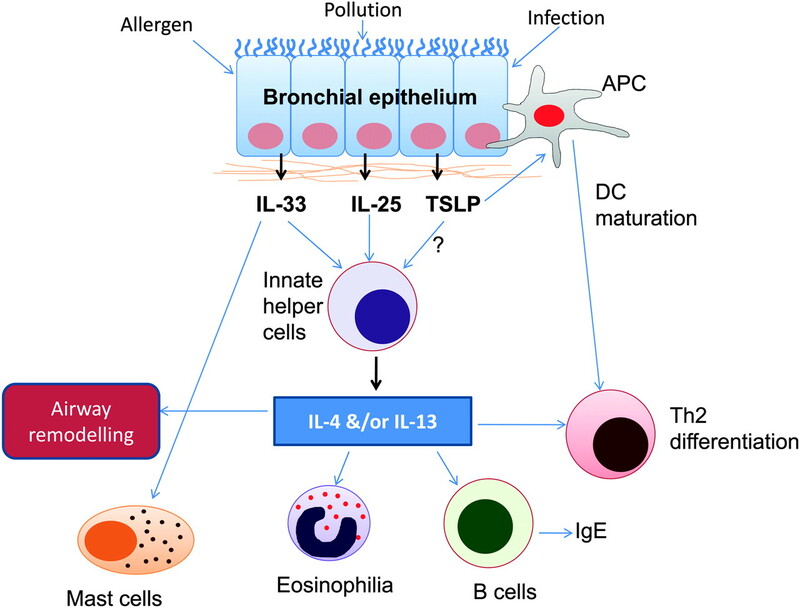 Exposure to environmental insults such as allergen, viral infection or pollution, in patients with asthma, triggers the secretion of interleukin 33 (IL-33), IL-25 and possibly thymic stromal lymphopoietin (TSLP) by the bronchial epithelium. These innate cytokines induce the production of innate helper cells, such as natural helper cells, 2 nuocytes 3 and MPPtype 2 cells, 4 which mimic T helper 2 (Th2) cells by rapidly providing IL-4 and/or IL-13 in a mechanism independent of the adaptive immune response, and subsequently generate mast cells, eosinophils and B cells and induce Th2 differentiation and airway remodelling. Whereas innate helper cells act as a first line of defence, later on, Th2 cells provide specificity and ‘memory’ to the immune response to environmental insults. Simultaneously, upon environmental exposure, direct recognition of inhaled allergens by antigen-presenting cells (APC) such as dendritic cells (DCs), basophils and macrophages, together with cross-talk directly with the bronchial epithelium, results in the release of the innate bronchial epithelial cytokines (IL-33, IL-25 and TSLP), which subsequently result in APC maturation and induction and differentiation of Th2 cells, resulting in Th2 cytokine (IL-4, IL-5 and IL-13) production.
. Differentiation of effector CD4 T cell populations. Annu Rev Immunol 2010;28:445–89.
. Innate production of T(H)2 cytokines by adipose tissue-associated c-Kit(+)Sca-1(+) lymphoid cells. Nature 2010;463:540–4.
. Nuocytes represent a new innate effector leukocyte that mediates type-2 immunity. Nature 2010;464:1367–70.
. IL25 elicits a multipotent progenitor cell population that promotes T(H)2 cytokine responses. Nature 2010;464:1362–6.
. Systemically dispersed innate IL-13-expressing cells in type 2 immunity. Proc Natl Acad Sci U S A 2010;107:11489–94. Funding The Wellcome Trust, UK. Grant number 083586/Z/07/Z. SS is funded by a Wellcome Intermediate Clinical Fellowship.